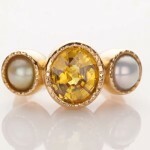 A very fine astrological combination of two real salt water pearls and a very fine oval cut golden yellow sapphire. In applied astrology this fine ring enhances the wearer’s sharp wisdom, influence in public, spirituality, status, prestige, honour, properties, assets, comforts, recognition, appreciation, name, fame, establishment, a very unique position in society, professional qualification, status, prestige, establishment, success, prosperity & rising. This is especially apt for natives with Lagna of Cancer, Scorpio, Pisces & Aries to achieve confidence, drive, vision, health, happiness, harmony, life span, stability, governing power, rise in luck, prosperity, establishment, peace, comforts, flow of income, wealth, assets, savings, power in speech, presentation, recognition, appreciation, name, fame & establishment. This stellar product well justifies our slogan ”Discover the Difference”!